Since it's January, I thought I would lay out some upcoming info regarding our foundation. As you may know, we started a non-profit to raise research money for LCA. We are laying the tracks before the train comes, but we feel we have a necessary role, in raising awareness. There is no cure for LCA, but medical science reminds us, we have every reason to be hopeful! So, today, we fundraise. We raise awareness. We love it, and feel we are doing a small role in the process of Leber's Congenital Amaurosis progression to one day have treatment. I have never been so passionate about anything. The core of who I am, is a charity person. Before the kids were born, I was very active with UNICEF. It's ironic, that my life is now affected personally, with a reason to turn my efforts, to something personal. Life works it's ways. I tell ya! Coming up we have about 15 events planned so far for the year, with about 8 more tenative that I don't have the dates on. We have a charity golf tournament (possibly 2), in which we are the beneficiary, as well as the Irvine Lake Mud Run, in which we are the beneficiary (for the whole year). All of our events are on our events page on our website. Not even a third of those are up, so bear with us. :) Events are only part of everything. We have grant writing, sponsorships, and corporate relationships that we have to keep up on. That's all the behind the scenes stuff, that takes up most of our time. I am learning so much, and love it. Our wonderful relationship continues with the Foundation Fighting Blindness. I have been asked to be the honorary speaker at this years Dinner in the Dark in Orange County. We have also been asked to be the Family Walk Chair for this years, VisionWalk. With us being so busy fundraising for LCA Research, I honestly told them I could not handle trying to get corporate sponsorships like I have in the past, as the Walk Chair. We were thrilled they offered us this position, as I love reaching out to families. Regardless of where we are with our foundation, or the place in our lives, I will ALWAYS participate in VisionWalk. FFB was our shining light during a very, very sad time of confusion and devastation, when we learned about Gavin's diagnosis. I will always cherish my personal relationship I have in my heart for FFB, and the wonderful people I have encountered, who are on the board with me at the OC Chapter, FFB. 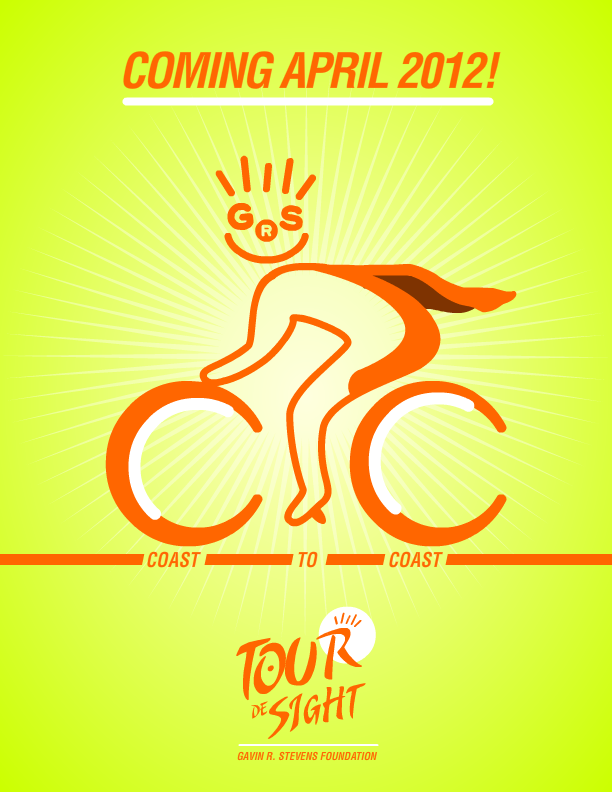 Our most exciting news, is Tour de Sight. If you don't know about it, please read what people are willing to do for us. A group of riders are taking about 40 days out of their lives, to ride a bike (bicycle) and pedal across the country to help us raise awarness of LCA. These people have children, they are married, they have careers and loved ones. I am still speechless! Anyhow, it's exciting, and it's happening in April of 2012. Our goal of raising $100,000 has been set, but they are all convinced of surpassing that. We will be reaching out to people as we pass through each state, we have news media getting lined up, and sponsors. Anyhow, I can go on and on, but check out our riders. 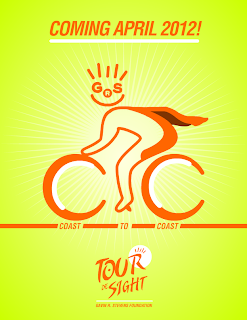 Add our Tour de Sight page on Facebook, and keep up with our adventure! Going through past posts, it's interesting to see how the process of dealing with such a devastating blow (Gavin's diagnosis), plays itself out. Things begin to unfold, and you really don't see how far you have come, until I reread some of the blog posts. Am I still sad that my son lives in darkness? Absolutely. Am I dealing with it much better than I ever thought I would? Absolutely. Am I reminded every day, many times throughout the day? Of course. It's hard to overlook when he falls, bumps, or cries because he cannot see the ball he is searching for, when it is half an inch from his leg. Do I still long to lock eyes with my son? Everyday. Do I appreciate who he is, and push everyday to make sure he is not defined by his blindness? More than ever. Many others have been fighting for LCA Research, and a cure, and treatment before Gavin was even born. I feel it is our duty to fight, not just for Gavin, but for those who will also be faced with Leber's Congenital Amaurosis. Gavin is happy, he is healthy, and he is here. I can't ask for much more, but I can ask that one day there be an option for him. That option is treatment. I will continue to hope for treatment. I will continue to trust medical science. I will continue to do my part, and fight for that option to one day be a reality for him, as long as God allows. Gavin’s 24” white cane is on back order. We should be getting it in the next few weeks. Meanwhile, we have been working on skills to get him prepared for the day that he is introduced to it. It has been a joint effort between his early intervention teacher, his Occupational Therapist and his O&M (Orientation and Mobility instructor). Getting his little hands ready (strength wise), is key for him to be able to maneuver the cane appropriately, and not just whack his brother over the head. Building up the thumb opposition strength, is one of the areas we were concentrating on. Of course, we do this through play. In the clinic setting with his OT, he loves, and I mean loves jumping on the tire. It’s great, because he is getting the needed vestibular stimulation (by jumping), but he is also working on hand/finger strength (by tightly gripping the poles). It is a necessary fine motor skill needed, to be able to sweep the cane from side to side. Swinging in a swing, and holding the ropes, is also a good way to work on strength. Another thing we tried is a very small shopping cart. It’s a mini replica of a real, metal, shopping cart. The idea behind this is, when he pushes the cart, the cart will bump into a wall, or hit a bump, before he will. The same thing that his cane will do. It’s the idea of maneuvering his body behind something. He also loves the cart. When we first introduced him to it, he took off! It’s hard to now keep up with him. When he bumps into something, he is learning to try to get around it. He will back up, and try a different direction. If we are at the park, and the cart goes off the sidewalk, and into the grass, he will try to pull it back, and change direction. He does get frustrated, as he just wants to charge straight ahead, but he is getting much better. It’s also a listening lesson for him as well. He hears the words “stop” “right” “left” “behind” “in front of”, etc. No, he does not understand them all (especially right/left), but it’s getting him familiar with the words. Here is a video of him pushing his shopping cart. This is also another pre cane toy he has, but right now he much rather prefer the basket. He does play with it, but doesn’t push it around all too much. I have a feeling when he does get his cane, he will not want to hold it for too long, or not at all. That’s just my gut telling me. He still throws things to the side. Yes, he is getting much better at placing things in front of him (in a bucket, etc), but newly introduced things, it is still taking him a while to get acclimated. Of course, I understand this is all going to happen over time, and I am totally ok with that. We are in no rush, but I am totally on board with introducing the cane early in life. There are opposing arguments about when a cane should be introduced. I weigh on the “earlier is better” side for many reasons. I will do my best to update, and I will also keep the tally over how many times Landon, and the rest of us are whacked! and your 2 year old YELLS…. Yes, I about died (from laughter), and overwhelming slight embarrassment. taught Gavin “It’s T shirt Time”, the night before. almost made me fall off my chair! The best part is, I had no idea he taught him this. I was laughing hysterically, as he picked such a timed moment to share his new phrase. We have a winner from last week's contest. I choose the winner using random.org. Congratulations to "meeyeehere" for being our winner! I will email you the code. She will get a $35 gift certificate towards CSN Stores. Thank you all for participating! If another cool contest comes my way, I might just have another giveaway for you. I have many Gavin updates, but so little time (story of my life). I actually have two posts halfway done. Hopefully I will get those posted soon. Thanks for again, bearing with me. I will leave you with this video of Gavin dancing and singing. He can hear a song once or twice and have THE ENTIRE THING MEMORIZED. It's quite fascinating. He heard this song a few times. We heard it at a wedding, and Troy played it and Gavin loved the music. He memorized it, and this is what you get. Him dancing and singing. They basically repeat the same thing, but the end is my favorite. The songs ends with a "da dum" - and that is just how Gavin ends it. It's so funny... we have tons of music videos, I should start posting them. This is the song on YouTube, in case you wanted to hear it clearly. Guess the Teletubbies enjoy this song too. CSN Stores has over 200 online stores where you can find everything from stylish modern dining room furniture to cute cookware to chic lighting pieces! I have not done any giveaways on Gavin’s blog, but if you’re like me, and have taken down all your Christmas decor, you may feel like your home is bare! I always tend to buy something new for the house after the holidays, so thought I would share this giveaway that was offered! Browse the popular brands such as: Rachael Ray, La-Z-Boy, and Sanyo, and that is just a few. This is in addition to over one million available products! I personally like Rachael Ray’s ORANGE casserole dish. It’s Gavin orange, and it’s only $29.95! Or the Walker toy for Gavin. Lots of tactile toys! CSN Stores’ have been featured on The Today Show, New York Times, Better Homes and Gardens… and many, many more. Leave a comment below telling us which item you like on from either CSNhome.com. Earn an extra entry by posting about this giveaway on your blog, and linking back to this post. Leave a comment, and you can win! Contests ends January 13 at midnight PST. I will choose a random winner and announce it on January 14th! You must be 18 years or older, and a US or Canada resident. Leave a comment with your name and email address so I can reach you if you win! From the traffic on this website, we have received many recruits for the Irvine Lake Mud Run from Gavin's blog! As you know, I don't post much of our non-profit on the blog, since we keep everyone informed on our foundation website. I don't want to overkill, especially for those who are not interested. Since we are in recruit season for the Irvine Lake Mud Run, I wanted to share this one post in case anyone would like to be part of our pledge program. It's self explanatory, I won't get into too many details... but you can win a $500 VISA gift card! For every $50 you raise, you get an entry for the gift card. EX: If you raise $300, you get 6 entries, etc. Email me: jen (at) gavinsfoundation (dot)(org). I will mail you a pledge packet, and all the tools you need to raise some pledges for Gavin. You can even do a super easy email campaign, and again I provide you with ALL the tools! All info is here. The total will be tallied at the mud run on April 10. The great people who run the Irvine Lake Mud Run chose Gavin's Groupies who support our foundation as the beneficiary for the entire 2011 year. So, even if you do not want to come and run, just come and join us for a fun filled day! There are food vendors, music, and of course, you can't forget the dirty dodgeball. All 9,000 + mud runners will be running for Gavin, to find a cure for LCA! Check out our Gavin's Groupies Facebook page for all the muddy pics from the past 3 runs. April 10 will mark our 1 year anniversary at the mud run. You can also read about Reggie's experience, who was the guide for a "blind" runner. Food for thought: There are 9,000 + runners for the mud run. What if each runner received a $20 pledge? That's close to $200,000 for research! Will you be one of the people we need to help us hit this mark? We cannot do it without you!